Ben Lecomte fell in the love with the ocean when his father first taught him to swim when he was five years old. It was from this love of the world’s waters and his father that motivated Lecomte to swim across the Atlantic Ocean in 1998. Originally from France but now residing in Texas, Lecomte became the first man to accomplish the feat without use of a kickboard. The swim raised awareness and money for cancer research. Lecomte’s father died of colon cancer in 1991. Twenty years after his record swim, Lecomte is taking to the ocean again, but with another goal in mind: environmental awareness. Lecomte, 51, began a six-month journey swimming 8,000 kilometers (4,971 miles) across the Pacific Ocean from Tokyo to San Francisco on June 5 to help conduct medical and oceanic research in partnership with institutions including NASA and the Woods Hole Oceanographic Institution. Lecomte will be swimming eight hours per day at a pace of 2.5 knots (2.9 mph) for 180 consecutive days. He is accompanied by a support sailboat and six crew members. The record-setting venture will be captured by Seeker and Discovery with daily videos and live moments for those following along. More importantly, Lecomte’s journey will provide 12 scientific institutions with more than 1,000 samples along the way to learn more about ocean plastic pollution, mammal migration, extreme endurance, and even long-term spaceflight. Along the expedition, Lecomte will swim through the Great Pacific Garbage Patch, a 60,000-square-mile collection of floating trash between Hawaii and California. As Lecomte paddles and kicks his way across the world’s largest body of water, he will be supported by a two-person inflatable boat that will keep him on the right track, feed him, and provide any necessary support should conditions require. The rest of the crew will be close behind on the support sailboat, Discoverer, collecting scientific samples as well as recording the one-of-a-kind adventure for an online audience. Lecomte spent four years training for The Longest Swim with a regimen including running, cycling, and swimming. He prepared mentally with meditation and exercises to disassociate his mind from his body while in the water. 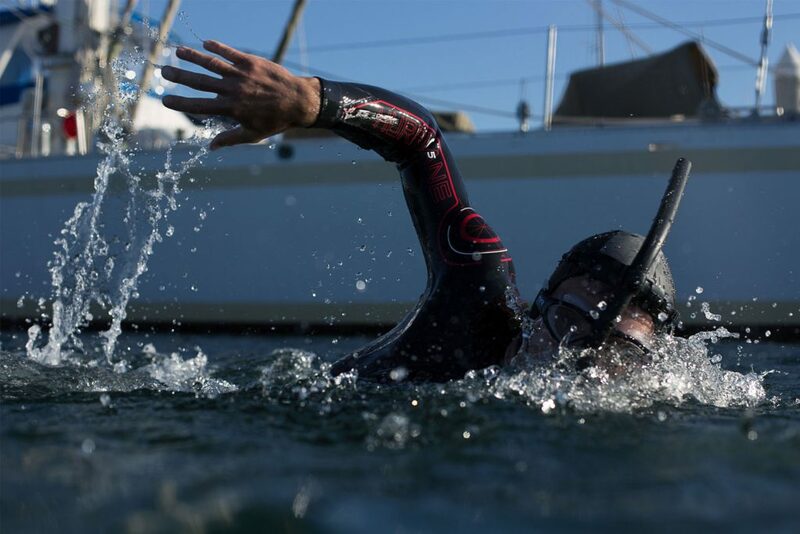 Lecomte, who said “never again” after completing his 73-day trek across the Atlantic Ocean in 1998, said he’s applying lessons learned from that experience to his second major swim. Follow Ben Lecomte’s journey across the Pacific Ocean with this live tracker.